Ebelskivers (also spelled aebleskivers) are like little doughnuts without the fat. 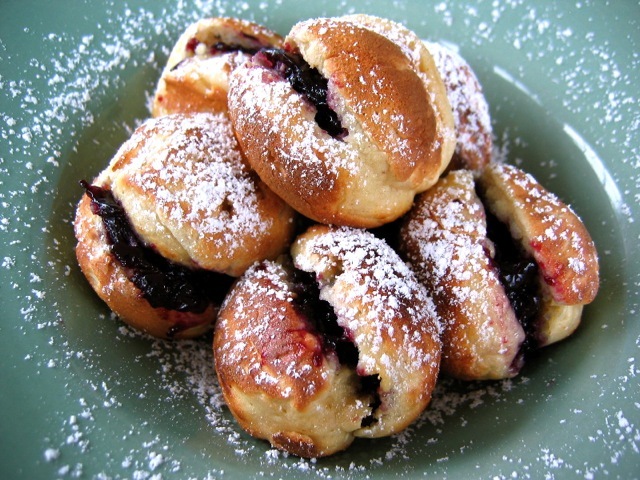 (They're very similar to the Dutch pancakes called poffertjes.) Traditionally they're filled with apples while cooking, but it's much easier to simply slice them open and fill them by hand after they're cooked. This recipe calls for a special cast-iron pan with [%amazonProductLink "seven round molds" asin=B00063RXQA newpage=true]. You drop some of the batter into each mold, cook for a few minutes, then turn the dough and cook on the other side. Serve ebelskivers with maple syrup, or slice them in half and fill with jam or lemon curd and mascarpone; sprinkle a little powdered sugar over everything and you're done. Sift the flour, baking powder, baking soda, and salt into a large bowl. In a smaller bowl, whisk together the eggs, sour cream, and milk. Add the egg mixture to the flour mixture and beat by hand or with an electric mixer until smooth. Heat a cast-iron ebelskiver pan over medium-low heat. Place a tiny bit of butter or canola in each mold and spread it evenly around the molds before filling each mold with a spoonful of batter. Cook until light brown, about 2 or 3 minutes. Turn gently with a fork or skewer and brown the other side. Transfer to a platter and serve hot. You can cut the sour cream in half, down to 1 cup, and still turn out fluffy, delicious ebelskivers.